Paul McGinley showed there’s life in the old dog yet when he opened with a stunning six-under 66 in The Senior Open at St Andrews. The three-time Ryder Cup winner (51) raced to the turn in five-under-par 31, then picked up further shots at the 10th and 14th to share the early lead. Battling the wind coming home, he made his only bogey of the day when he missed from seven feet at the 15th but finished with three solid pars to end the day tied for third with Canada’s Stephen Ames, just a stroke behind American Kirk Triplett and Thai Thaworn Wiratchant, who shot seven-under 65s. “I’ve been playing solid,” said McGinley, who practised hard between commentary stints during The Open last week for what is just his fourth start of the year. "I've played two tournaments in Europe this year, and had Top-10s in both of them. I haven't played a lot. Obviously, I've got other commitments going on but I'm really pleased. Playing the Old Course on a day like this is just fabulous." He was pleased to make hay with the wind at his back on the way out and even happier to play well coming home into the breeze. "Really tough," he said of the conditions. "That's where the teeth in St. Andrews is. You know, and when it comes in off the left, that's probably the tougher of all the winds. "Any time you come here, even for a practice round, there's something magical and mystical about the place. "If you love golf and the history and all it stands for, this is the place to be." As title holder Bernhard Langer shot 67 and Tom Watson a 69, Ronan Rafferty was the next best of the Irish with a 72 as Brendan McGovern (74), Des Smyth (75) and Eamonn Darcy (76) all struggled. On the PGA Tour, Seamus Power opened with a bogey-free, four-under 68 in the RBC Canadian Open as Robert Garrigus posted a nine-under 63 to lead by a shot in the clubhouse from rookie Adam Schenk. Power is 119th in the FedEx Cup standings and needs four solid weeks to make the top 125 who keep their cards while late starters Graeme McDowell (155th) and Shane Lowry (177th) need to start showing form soon. After a weather delay during the round, McDowell got to four-under with just the 18th to play while Lowry was two-under playing the same hole. On the European Tour, Gavin Moynihan and Ruaidhri McGee failed to get anything going in the Porsche European Open in Hamburg where Bryson DeChambeau shot a six-under 66 to lead by a stroke from Germany’s Benedict Staben and French trio Mike Lorenzo-Vera, Joël Stalter and Romain Wattel. Moynihan shot a five-over 77 and McGee a 79 as Masters champion Patrick Reed opened with a 70 to share 27th on a tightly packed leaderboard. At the Challenge Tour's weather-delayed Euram Bank Open in Austria, Dubliner Paul McBride opened with a three-under 67 to share 12th spot, just three shots behind American Sean Crocker and the Czech Republic's Filip Mruzek. McBride was tied for 12th when play was suspended due to thunderstorms while Cormac Sharvin shot 68, Michael Hoey and Dermot McElroy 70s, Gary Hurley a 71 and Brian Casey a 73. Clandeboye’s Jonathan Caldwell was one under and Daniel Brennan one over with three holes of their rounds to complete when play was suspended due to thunderstorms at Adamstal Golf Club. Paul McGinley racked up the biggest number of his life today when he turned 40. But the Dubliner has no need to feel downhearted about a nightmare year that was only brightened by his contribution to Europe’s Ryder Cup annihilation of the US at the K Club. 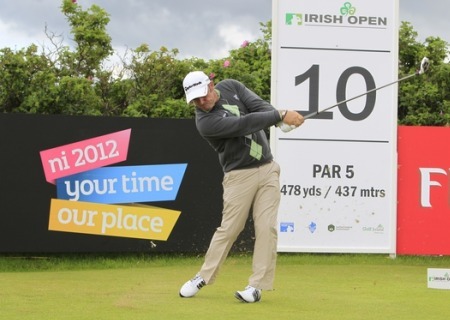 Close pal Padraig Harrington knows exactly what the problem is - because he’s been there before himself. 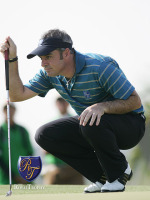 Another false dawn or the beginning of something big for Paul McGinley? On a day when Rory McIlroy signalled his intent by outscoring his Race to Dubai rival Lee Westwood by four shots with an opening 67, McGinley birdied three of his last four holes for a five under 66 in the Omega European Masters at Crans. Must be Ryder Cup time again.